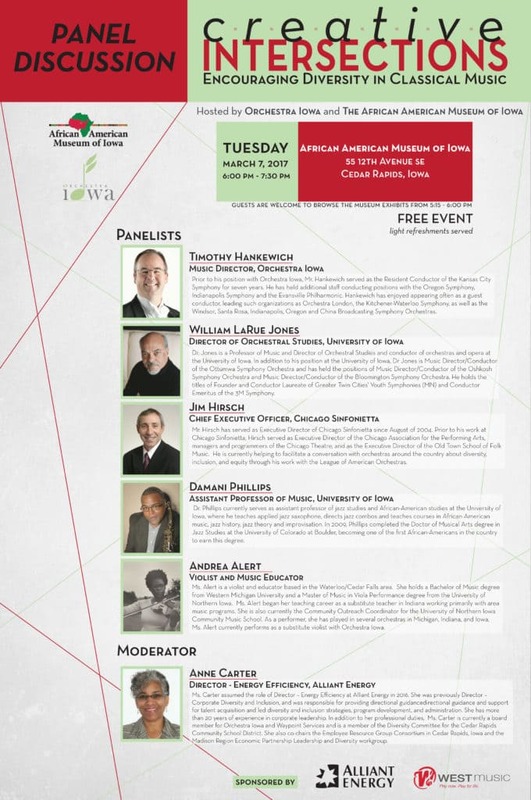 Join Orchestra Iowa and the African American Museum of Iowa for a free panel discussion on Tuesday, March 7 at 6:00pm, titled Creative Intersections: Encouraging Diversity in Classical Music. The issue of diversity in classical music has been receiving a great deal of attention the past 5 years, and with Branford Marsalis headlining our season at Orchestra Iowa this year, there was a tremendous opportunity to open this conversation in the Eastern Iowa Corridor. I hope you can join us on Tuesday, March 7 at 6:00pm at the African American Museum of Iowa to help spur a robust conversation on this important topic for our region.